This article describes how to create a variety of sampling profiles. To help you set up a schedule of observation activity to suit the needs of individuals, we have included this sampling profile function. This allows you to change the intervals you carry out different observed activities and change the frequency to suit the experience and support needs of the individual. For example; you may want to observe teaching and learning practice once per month for a practitioner who is new to the organisation and then once they need less support move them over to a less frequent schedule. 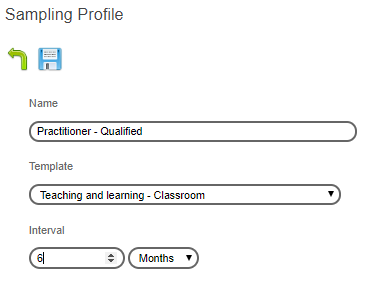 Click on the 'Sampling Profile' icon to start developing your different schedules. Click on add 'New Schedule' icon to start developing your sampling plan. Name your schedule type, attach it to the right template and prescribe the interval in which you want the system to schedule the activity. As you build your different sampling types they will be added to the 'Sampling Profile page. Ensure that your sample type descriptions are meaningful. This will help when you start to schedule them to observees.